The Sisters of St.Basil the Great, an international religious Order of the Eastern Catholic Church, was founded in the 4th Century through the inspiration of St. Basil and his sister, St. Macrina. From their roots in Eastern Europe, Basilian Sisters first came to Philadelphia in the United States in 1911 to serve the immigrant population. In 1921, Rev. Mother Macrina founded a unit of the Order to serve the Ruthenian Eastern Catholics in Cleveland in 1921, which is Our Lady of Perpetual Help Province, with its center located in Uniontown, Pa. 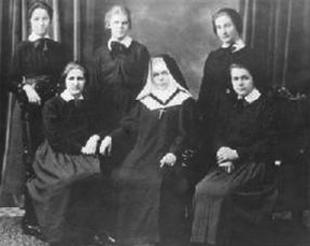 The earliest members cared for orphans in Elmhurst, Pa., which was sponsored by the Greek Catholic Union. Soon thereafter, they developed an extensive system of parochial schools located from Bridgeport, Conn. to Chicago. Through these schools and through summer and afterschool religious education, the Sisters fostered the education of young people. honor of Our Lady of Perpetual Help was initiated and continues to the present. Academy, a high school for girls. The Sisters later acquired more adjoining property and built a larger monastery on the property in the mid 60’s. Presently the former monastery, which is now the House of Prayer, serves as a center for spiritual renewal; the Sisters have been involved in retreat ministry since the early 1940’s. Another building on the estate served as St. Basil Home for Aged Women from 1947-97 and later a halfway house for addicted women, 2000-2012. In 1971, the Sisters completed construction of Mount Macrina Manor Nursing Home and expanded it 20 years later. It is a skilled care, therapy and dementia-care facility with 139 beds. Mount St. Macrina also includes a large cemetery and mausoleum, both open to the public and surrounded by meditation gardens. The Religious Gift and Card Shops have served the public for many decades. The grounds, made sacred by the many years of praying Sisters, pilgrims, retreatants and visitors, provide a serene and green space for all who come. The Sisters continue to be blessed as they live and serve on these holy grounds. The Sisters of St.Basil also continue to serve the Church in important ways in other locations. The Sisters minister in Pittsburgh, Erie and Wilkes-Barre, Pa.; Youngstown, Ohio; St. Petersburg, Fla.; Phoenix, Ariz.; and,Las Vegas, Nev., meeting various needs of the Church. Since all the Sisters are committed to praying the Divine Office of the Byzantine Catholic Church, the heart of their service to the Church is their intercessory prayer for all of its intentions. In this the Sisters feel particularly blessed and privileged.